Happy First Birthday, Emily Rae! I wrote this yesterday for my baby girl’s first birthday, and didn’t have a chance to post it since we had such a fun, beautiful day together. I’m officially the mama of a one year old! One year ago you entered our lives. I heard it before- life changes completely when you have a baby. I never could have understood that though until we had you. You have taught me so much. You have taught me to take each day moment by moment. To not fear change. To understand everything is actually ALWAYS changing. To find a deep strength and confidence I never knew was inside of me. Knowing that I grew you and gave birth to you makes me feel like the strongest person in the world. I admire your friendliness and love of socializing and meeting new people. I admire your humor. I admire your presence and honesty; how you love to read books- but only the ones YOU want to read. I admire your warmth and cuddliness and big smiles. I admire your awareness and strength and wit. Thank you for giggling and clapping for me when I do ballet for you. Thank you for laughing at my jokes. Thank you for practicing yoga with me. Thank you for always being game for a stroll and an adventure. Thank you for being nothing else but exactly who you are, and that person is someone I love truly, madly, deeply (as the 90’s band Savage Garden says). Happy first birthday to our love! We will love you forever. On Saturday as millions of people participated in the Women’s March Emily took her first steps. How incredible that on such a historic day when people marched to have their voices heard, Emily decided to walk too! I am so proud to live in a country where millions can gather together to peacefully protest. And I am so proud to have a daughter who day after day inspires me and reminds me that the future is bright. I will never forget the feeling of elation when President Obama was elected. My best friend Beth and I were living in “Bethica’s treehouse” our cozy first ever grown up apartment in Clifton. That’s also the year Puddin’ came into our lives. She was a huge Obama supporter, as you can see! Puddin’ left this world a few months ago, way too soon. She is so missed. I watched Oprah interview Michelle Obama a few weeks back and the thing that struck me the most was when Oprah asked how the First Lady was able to deal with all the criticism. She answered to the effect of- “well I’m a grown up.” I’m so frightened that being a grown up- someone who can handle criticism and other opinions with dignity and respect- is on the way out and immaturity, disrespect, and tantrums are on their way in. I hope I’m wrong. President Obama said, “The path that this country has taken has never been a straight line. We zig and zag, and sometimes we move in ways that some people think is forward and others think is moving back.” I have to believe that even when we are zigging and zagging we inevitably are moving forward towards compassion, understanding, and peace. Seeing the momentum of the Women’s March gives me hope. While I won’t be there, I’ll be watching, praying and believing that the passion of so many will keep us moving forward and not backward. Let’s make our sons and daughters proud and not give up the rights that others fought so hard to grant us. I woke up this morning feeling pretty damn good because Emily slept past 6am. Yahoo! Then I looked in the mirror, and here’s what I saw. I could not help but laugh. It’s okay, you can laugh too. This one is for all the moms, dads and human beings out there wondering how some people seem to have it all together. I’ll let you in on a little secret… NO ONE does! To be human means to have days like today where I most definitely do not have it all together. This photo is what happens when the only time I have to shower is after Emily has gone to bed, and then I am just too tired to do anything with my hair. Hellooooo world! Check ME out. Today I am thankful for coffee, food delivery, and Emily’s cuteness which makes reading “Baby Babble” a thousand times in a row bearable. There is no one I’d rather read with while caffeinating myself up than you Miss Em! It’s official, we have entered toddlerhood. This morning as I tried to brush my teeth Emily repeatedly tried to grab the toilet wand. When I attempted to make breakfast she discovered how to open the kitchen drawers. Then, when I tried to sit down and pay bills, in a split second she grabbed Romeo’s rather large water bowl off the kitchen table (which had been placed there because she’s always trying to spill it) and she poured it all over her head. This all happened before 8am. I’m equally exhausted and amused! If this is only the beginning of her toddler shenanigans I can only imagine what is coming next. Oh how tired I am and oh how much I love her! Here is our first video of 2017. Hard to believe in just a few short weeks Emily will be one year old! How far we have come. I type this with one hand as Emmy sleeps in my arms. To think a year ago she hadn’t even arrived! 2016 started with the birth of our sweet baby girl which changed the course of our lives forever. Ten weeks later came our first nephew and godson Miles. By summer we settled into our new home. I watched my best friend marrying the love of her life, and saw our friends’ welcoming their baby girl, Aylya. The summer ended with the loss of my grandmother, the strongest woman I knew. Then came the birth of our friends’ baby boy, Lee. And the arrival of one of my oldest friend’s baby boy, Jake. Now the year ends with our nephew Preston Ryder arriving just in time! There was so much new life! (Welcome also to Juliette and Gemma!) There was also death. There was LOVE. There was pain. There was everything in between. 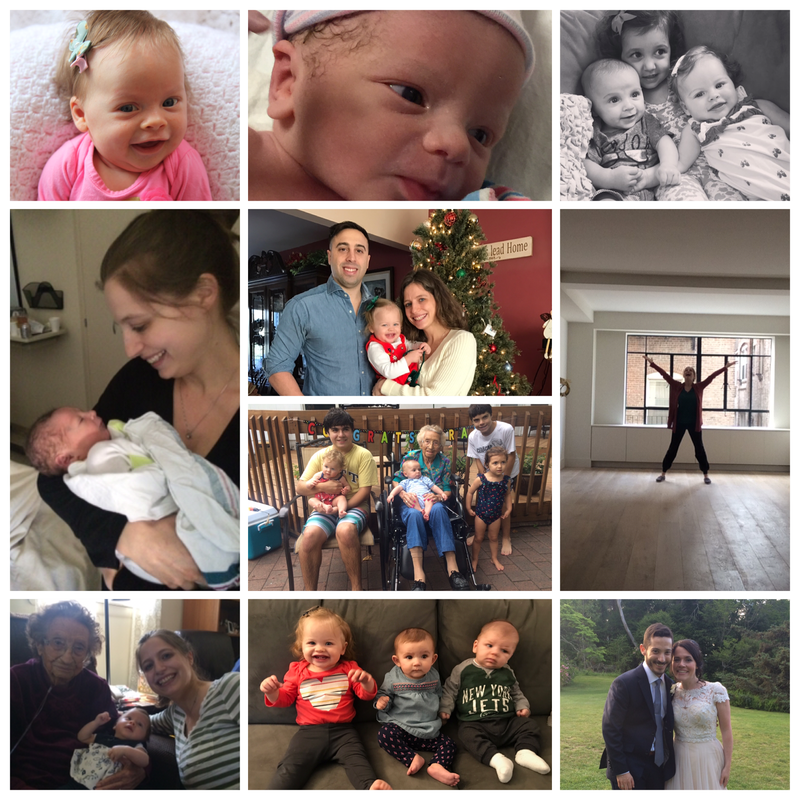 To all of my family and friends near and far who have been so supportive this year as I settled into new motherhood, I love you! Nanna, I hope you’re watching us today and celebrating with us. Farewell 2016! Onward to 2017. Let’s see what you may bring.